Warner Bros. has released the second trailer for Geostorm, showcasing the devastating effects of a very extreme version of "climate change." While this fictional tale surely won't sway the naysayers who think climate change is a hoax, with these massive action set pieces that show various forms of weather systems getting extremely out of control, it certainly could provide some big-budget escapism from the current political climate. This trailer hints that Geostorm may in fact be the most action-packed movie to hit theaters all year, and it could also be a dark horse box office blockbuster, starring Gerard Butler. The story is set in the aftermath of an unprecedented series of natural disasters that threatened the planet in ways never been seen before, which lead the world's leaders to come together to create an intricate network of satellites to control the global climate and keep everyone safe. The trailer, from Warner Bros. YouTube, showcases a tiny glimpse of these satellites in action, as they release a number of capsules into a cloud formation, which stops a brewing storm before it happens. We also see President Andrew Palma (Andy Garcia) at a press conference, where he reveals that natural disasters are now a thing of the past, thanks to this intricate satellite system. Unfortunately, one of the satellites malfunctioned over Afghanistan, turning this desert climate into a winter landscape, with footage showing several Afghani people literally frozen to death. Instead of shutting the whole system down, the government sends Jacob Lawson (Gerard Butler) into space, to try and fix whatever is wrong, but while he's up there, Max (Jim Sturgess), the estranged brother of Jacob, is locked out of the system, as it becomes clear that these destructive weather conditions happening around the globe were not a malfunction, but by design. Both Jacob, in outer space, and Max, on Earth, must race against the clock to find out who created this Geostorm before the entire world is wiped out. The main cast also includes Abbie Cornish as Secret Service agent Sarah Wilson, who is dating Max; Alexandra Maria Lara as Ute Fassbinder, the ISS astronaut who runs the space station, Daniel Wu as Cheng, the Hong Kong-based supervisor for the Dutch Boy Program, with Andy Garcia as U.S. President Andrew Palma and Ed Harris as Secretary of State Leonard Dekkom. The film also stars Adepero Oduye (The Big Short, 12 Years a Slave), Amr Waked (Lucy, Syriana), Robert Sheehan (The Mortal Instruments: City of Bones, Season of the Witch) and Eugenio Derbez (Instructions Not Included). Warner Bros. has handed out an October 20 release date, which is currently the busiest box office weekend of the year, with six new movies opening in wide release. Going up against Geostorm will be Universal's The Snowman, Sony's Granite Mountain Hotshots, The Weinstein Company's War With Grandpa, Lionsgate's Tyler Perry's Boo 2! A Madea Halloween and PureFlix's Same Kind of Different as Me. Dean Devlin, best known for co-writing Independence Day and Stargate with Roland Emmerich, makes his feature film directorial debut with suspense thriller Geostorm, working from a script he co-wrote with Paul Guyot (Leverage, The Librarians). Geostorm is being produced by Skydance's David Ellison, Devlin, and Skydance's Dana Goldberg. Herbert W. Gains and Electric Entertainment's Marc Roskin are the executive producers. Rachel Olschan of Electric Entertainment and Cliff Lanning co-produce. Geostorm is a joint venture between Skydance and Electric Entertainment, Inc., which will be distributed in 3D and 2D in select theaters and IMAX, by Warner Bros. Pictures. 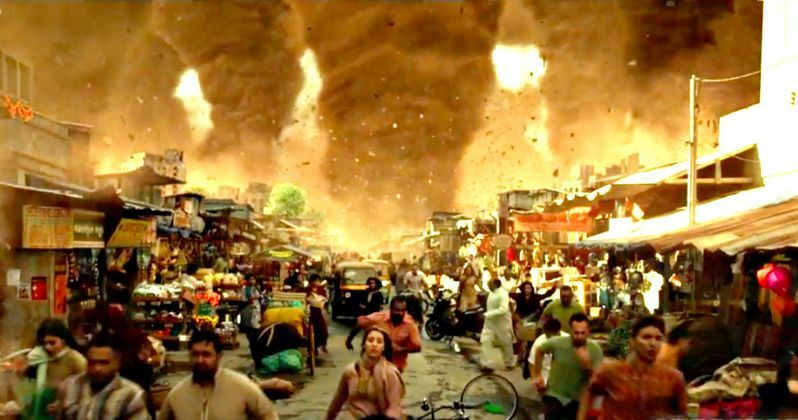 Take a look at the new trailer for Geostorm below.